Sublimation is conceptually similar to distillation. It is a method in which an impure sample is heated and a purer sample collects someplace cooler nearby. Instead of relying on an equilibrium between the liquid phase and the gas phase, sublimation involves an equilibrium between the solid phase and the gas phase. At lower temperatures, a solid material is expected to be crystalline and ordered. However, at higher temperatures, enough energy may be gained by the molecules in the solid so that they can escape into the gas phase. Your normal experience tells you that is you heat up a solid, it just melts into liquid. To obtain a gas, you need to heat up that liquid. However, if you have ever spent time in a cold, snowy place on a sunny day, you may realize that idea isn't always true. On sunny, cold days, a snow bank will shrink and shrink without leaving any puddles. Where do all of the water molecules go? Into the gas phase. They float away into the air. 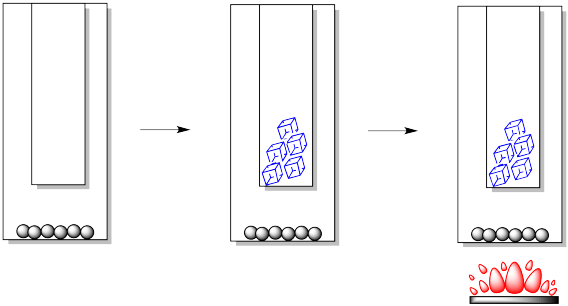 In sublimation, molecules in the solid phase escape directly into the gas phase. However, in a purification method, we typically want to obtain a material back in its original form, only without the impurities. We want those gas phase molecules to form a solid again. Of course, on winter days, that happens all the time. Water vapour in the air routinely forms crystalline ice again, which then falls as snow. The trick is to let the gas phase molecules rise up to a place that is cold enough to strip a little energy away and shift that equilibrium back towards the solid. In the laboratory, we can construct a simple sublimation apparatus in a number of different ways, but there are always two key components. We need an outer vessel or lower vessel. This is the place where we would put the impure sample. We also need an inner vessel or upper vessel. This is the place where we want the pure solid to form again. To purify by sublimation, molecules in the solid phase are heated so that they go into the gas phase, then cooled to form a solid again. Usually the cooling is provided by plain old ice or cold water. Occasionally, dry ice may be used. The heat is not usually provided by an open flame, but by a hot plate or heating bath. After the sample is heated for some time, crystals begin to form higher in the apparatus. Usually, they form on the cold finger, but they may also form higher up the walls of the outer vessel. The crystals may first appear in different forms or habits: they may be light and feathery, round and scaly, needles or blocks. Very carefully, the cold finger must be separated from the outer vessel. Sometimes the crystals are barely hanging on to their perch, so the slightest movement will cause them to fall. Other times, they may be very firmly attached and it might take some effort to scrape them off.